I see my next "movie" coming from here! ; that is, of course, when it comes out on the pc. Pre-ordered for the XBox as well... very excited! The Red Dead Redemption 2 release date is October 26 so that gives you plenty of time to pre-load the game – you’re going to need it too, as it clocks in at around 90GB on Xbox One and PS4. If you’re buying on disc, you’ll get two of ’em. It’s that big. If you’re unsure which format to pre-order, the PS4 version of Red Dead Redemption comes with 30 days early access content that includes a bunch of gear for Red Dead Online, going live in November. It feels like we’ve been waiting forever, but the cowboy hat-wearing silhouette of Red Dead Redemption 2 has finally appeared on the horizon. As it slowly gallops towards us, we’re going to attempt to make the final hours of that wait a little less painful. With that in mind, here’s everything we know about Red Dead Redemption 2. Hunting plays a big part in Red Dead Redemption 2, as you are living off the untamed land. Since you will have the option of scouring the land for meat and pelts, this massive world will provide bountiful opportunities. In fact, there are around 200 animal species, including a range of fish, birds, and land animals. Each animal will have its own unique behaviour, too – predators will hunt, nocturnal animals will hide away during the day, and the ecosystem will interact in surprising ways. When hunting, you can follow tracks on the ground, as well as blood flecks in the snow from recently injured game. You also have to account for wind direction to mask your scent. The quality of the meat will also be affected by how clean the kill is, with the bow and arrow making the cleanest kills. You can also fish in Red Dead Redemption 2, and selecting the right bait and lure is essential to catching different types of fish. Rockstar has given fans what they really want in Red Dead Redemption 2: horse balls. 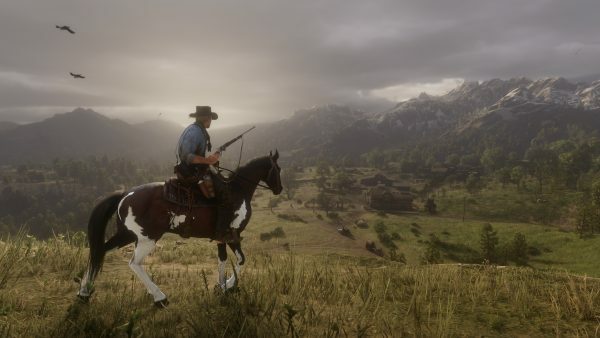 Fans have marvelled over the inclusion of ever more realistic looking horse anuses for years and Rockstar has taken it a step further this time with horse balls that will shrink in the cold and have a generous swing about them – exactly what you need in a next-gen gaming experience on this scale. You will also have full control over what type of horse you ride. Here’s the official Rockstar blurb on horses and horse customisation in Red Dead Redemption 2: “There are 19 breeds of horse in Red Dead Redemption 2 from Appaloosas and Arabians to Shires to Mustangs, each of which handles differently with its own defined characteristics. Horses can be captured and broken out in the wild, purchased from stables or acquired by more underhanded means, of course. There are four minigames confirmed that will be available to play in Red Dead Redemption 2, as if horse balls and x-ray weapons targeting wasn’t enough to contend with. 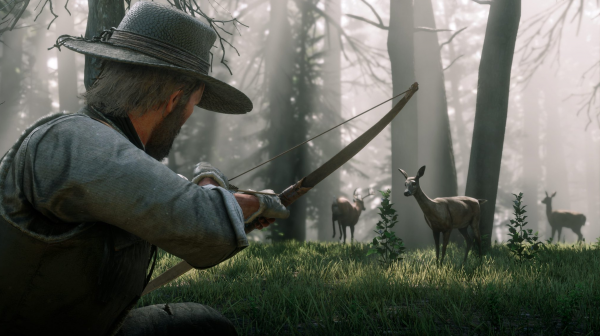 Hunting and fishing are more than just survival tools; you’ll be handsomely rewarded for big kills and catches in Red Dead Redemption 2. You’ll also be able to play card games, such as Poker, with friends and allies alike. Socialising with your campmates is recommended and bonding with them over a friendly-ish game of cards could be the way forward. There’s a rumour that Dominos may also be featuring in the game, not least because Rockstar is selling a Red Dead Redemption 2 Domino set online. Five Finger Fillet will also feature in Red Dead Redemption too which will hopefully come with a good targeting system to avoid any mishaps. 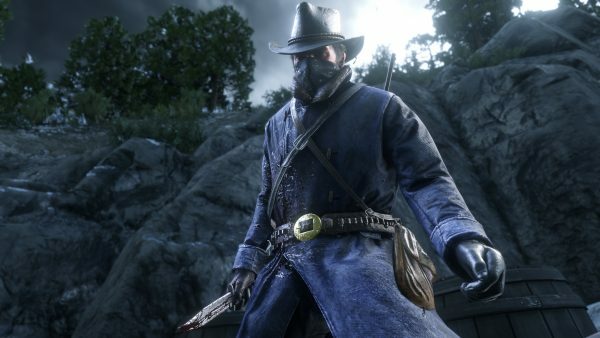 You will be able to customise the look of Red Dead Redemption 2’s main protagonist, Arthur Morgan. 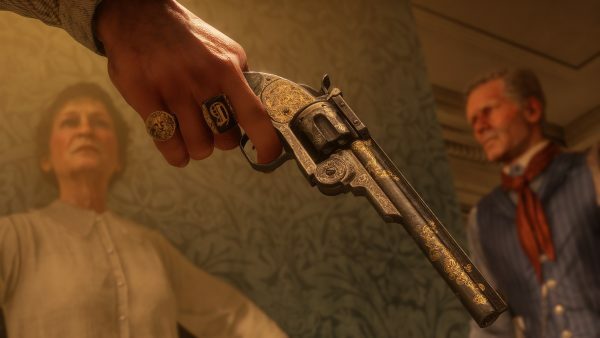 You can have your guns engraved, change the look of some of your carried items and even change Arthur’s appearance. Arthur’s hair and beard grow in real time, so you can visit a barber a la The Witcher 3 to get a trim, style your beard and get a new look. Clothing now comes as single items as opposed to whole outfits and you can customise not only what Arthur wears, but how he wears it, such as deciding whether you want his trousers tucked into his boots or not. However, don’t be tempted to think you can go gallivanting into the snowy hills with a just a shirt with the sleeves rolled up – your stamina will be affected if you wear clothing that doesn’t suit the climate you’re in. You also have the option of customising your base camp. You can bring back game, chat to fellow gang members around the fire and play cards with your pals. You can also choose to contribute positively to the camp, such as stocking up on food, supplies and medicine. Allies will comment on your deeds contextually and the responses will be different each time you visit, giving you the feeling that you’re doing something meaningful. Whether you contribute or not will affect morale, which can affect the outcome of quests, activities and people you can engage with. You can also upgrade certain aspects of the camp, such as unlocking additional hitching posts, stocks of food, ammo and new fast travel points. Your sleeping area can also be customised with rugs, hunting trophies and more. Rockstar has announced that there will be an online multiplayer segment in Red Dead Redemption 2 called Red Dead Online. It will initially be released as an open beta sometime in November and access to Red Dead Online is free to anyone with a copy of Red Dead Redemption 2. 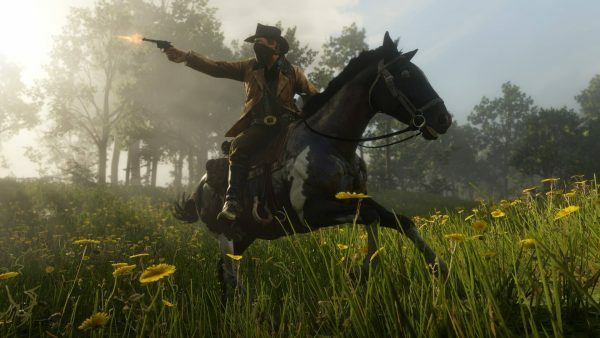 Rockstar accidentally revealed that they will be selling a Red Dead Redemption 2 PS4 Pro Bundle which describes some online content as a “Timed Exclusive for 30 days” and that Red Dead Redemption 2 will require a minimum storage space of 105 GB, so it’s time to start thinking about what games you’ll be culling to make way for this beast. 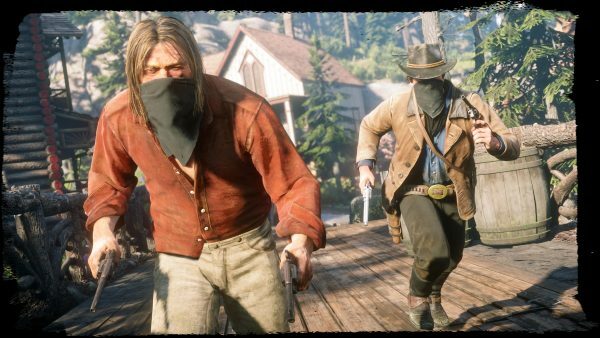 Red Dead Online will feature narrative, competitive, and cooperative gameplay that can be enjoyed solo or with friends, much like GTA 5 online. Red Dead Online will support 2-32 players and uses the gameplay of Red Dead Redemption 2 as its foundation and will be updated and adjustment over time. Rockstar says it wants Red Dead Online to be as in-depth and robust as GTA Online. 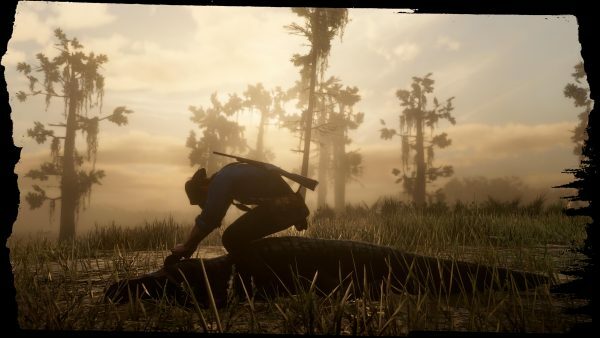 There has been no mention of a wild west battle royale mode yet, but a recent information dump mentioned that there would be multiplayer modes titled Revive and Survive, and Money Grab. 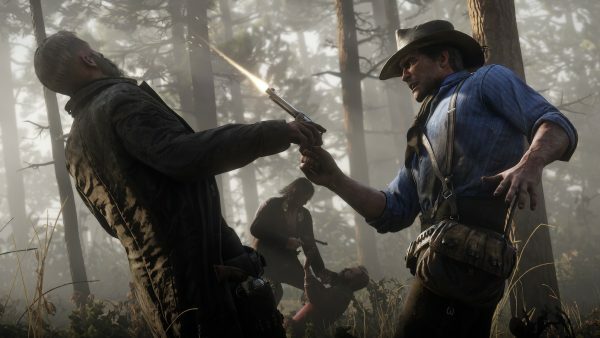 Weapons and gunplay in Red Dead Redemption 2 are set to be deadlier than ever. As a wanted man, Arthur Morgan has refined his skills to stay one step ahead of the law and anyone else who decides to cross him. You’ll be able to carry a limited number of weapons when on foot, such as sidearms, rifles and bows. You’ll also have a hunting knife, throwing weapons, and a handy lasso. Your horse acts as your inventory cache and when you’re either riding or standing near the horse you’ll have full access to all your guns and gear. 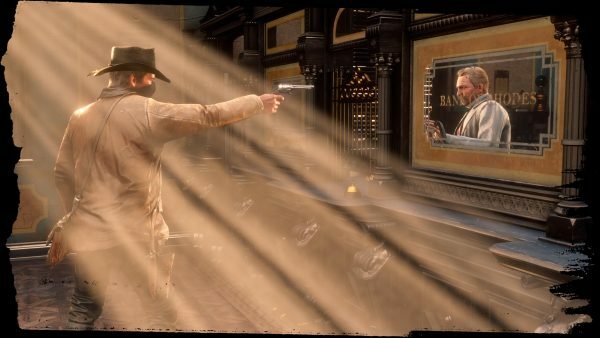 The Dead-Eye targeting system returns to Red Dead Redemption 2, with five levels of lethality, including slowing time down to unleash a fury of bullets upon a group of enemies, and x-ray vision that lets you target vital organs for the ultimate gory takedown. Weapon performance will degrade over time if you don’t maintain them properly – overuse or the environment can affect how effective your weapon is. If you keep wading through water and bogs, expect your weapons to rust quickly. You’ll also be able to add mods to weapons that can improve recoil, range and damage. 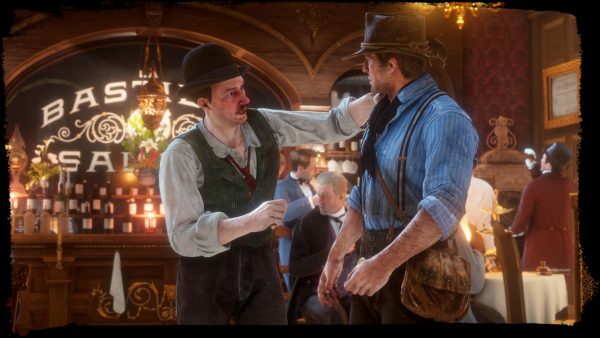 Arthur is skilled in fisticuffs and can use close range takedowns, both violent and non-violent. You can also fire a warning shot in the air to disperse wildlife or catch the attention of NPCs. You can also threaten folk with your gun, which is what you’d expect from a wanted man, really. 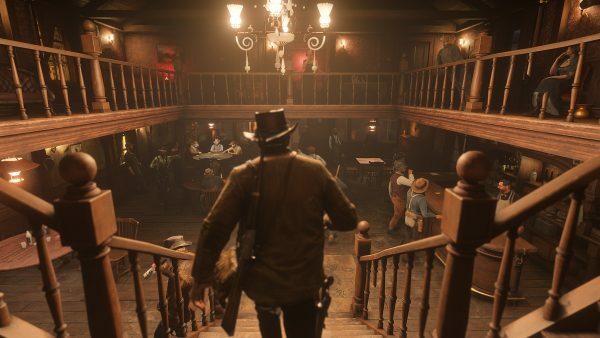 Included in the Special Editions of the game, Bank Robbery and Gang Hideouts are exclusive content and will not be available for people who buy Red Dead Redemption 2 vanilla. These story missions were created specifically for people who shell out more cash for the Special Editions of the game, according to Rockstar. Red Dead Redemption 2 takes place in America, 1899, at the end of the Wild West – outlaws are hunted across the country as the old makes way to the new. As Arthur Morgan, a member of the Van der Linde gang, you must try survive this transitionary period while attempting to make your fortune. Morgan and the rest of the gang are forced to flee across America following a botched robbery. The group is falling apart, and it’s up to you where your loyalties lie. It’s a prequel to the first game and will feature familiar faces, including the first game’s protagonist, John Marston, who himself is a member of the Van der Linde gang. Considering Arthur Morgan isn’t mentioned in the first game, we’re not expecting a happy ending to his story. 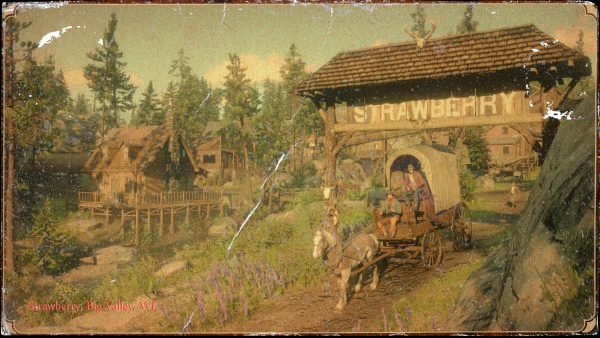 Red Dead Redemption 2 will feature some of the locations from the first game, including Blackwater and Armadillo, but the map is much larger and more varied. A small Heartlands town that attracts traders, ranchers, cowboys, gamblers, outlaws, and prostitutes, so prepare for trouble. Coal mining is a bustling business in this town despite the terrible pay and death rate amongst the workers. Saint Denis lies on a key trade route where people from all backgrounds and livelihoods live in harmony. The crime rate could be better, though. This snowy town is strategically-located near a mountain pass between Beartooth Beck and the Dakota River, which we’re sure is no coincidence. A peaceful town that is caught in the crossfire of two warring plantation families that you’ll obviously become embroiled in. Strawberry’s new Mayor – an “East Coast eccentric” – is transforming the town into a tourist attraction. The locals aren’t exactly impressed with this liberal approach to their humble abode. You can find this settlement in the Bayou swamps. Most of its citizens live off the land and keep to themselves, which an outlaw might find useful from time to time. You are escaping from the law. It makes sense, then, that you have to live off the land. Red Dead Redemption 2 features survival elements and you have to keep yourself and your camp fed. You can do this by hunting and turning the sustenance back in at your camp. Be careful, though – that food won’t last forever. Red Dead Redemption 2 features a degradation system where dead things slowly rot and attract carrion. There weren’t any freezers in the Old West. According to rumours, Rockstar is adding its own take on the battle royale phenomenon to Red Dead Redemption 2’s online portion. The alleged leak places Battle Royale mode next to modes called Revive, Survive, and Money Grab. It works with the survival mechanics mentioned above. Perhaps a steam train drops everyone off. After all, I don’t think they had parachutes back then either. Rockstar confirmed that the Honor System from the first RDR will return, and will affect how Morgan is treated by the NPCs and merchants in towns and settlements. The scale ranges from honorable to outlaw, and it’ll be interesting to see how this morality manifests itself in the final game. As reformed outlaw John Marston, it made sense that you could either try to maintain your integrity or relapse into lawless rebellion. As Arthur Morgan though, it seems like you’re still waist-deep in the degenerate lifestyle of a renegade. How “good” can a righteous playthrough be if you’re still robbing banks and killing people? We also know that, based on your reputation from the Honor System, shopkeepers with alter their pricing and people will treat you differently. It’s possible that certain quests will only be available to upstanding members of the community, while others will require a less discerning gentleman, so to speak. You’ll also be able to approach different situations in different ways, which will contribute to your reputation. The example used in previews has been where Morgan is looting a fishing settlement. When a fisherman appears and asks if Arthur would kindly put back the things he’s knicked, you can either whip out your six-shooter and gun him down, take the shoelace express and hightail it out of there, or menace the man into keeping schtum. The time of day, location and any partners you choose to bring with you can also affect the outcome of quests.